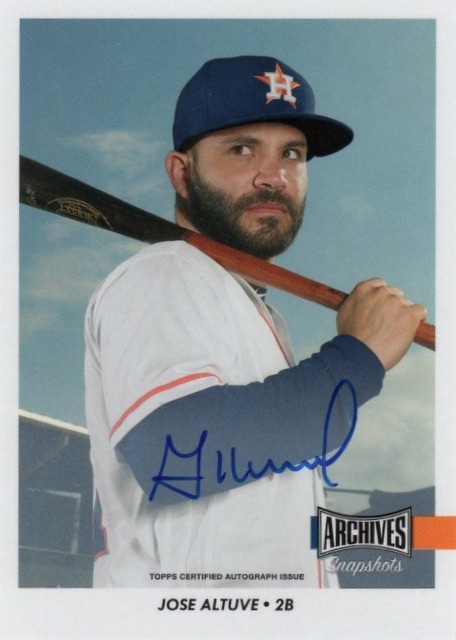 Again reaching into the Topps Vault for player photography, 2017 Topps Archives Snapshots Baseball uses a simple design and format to achieve an image-focused MLB release. Exclusive to the Topps Online Store, each 12-card box delivers one base parallel and one hard-signed card. 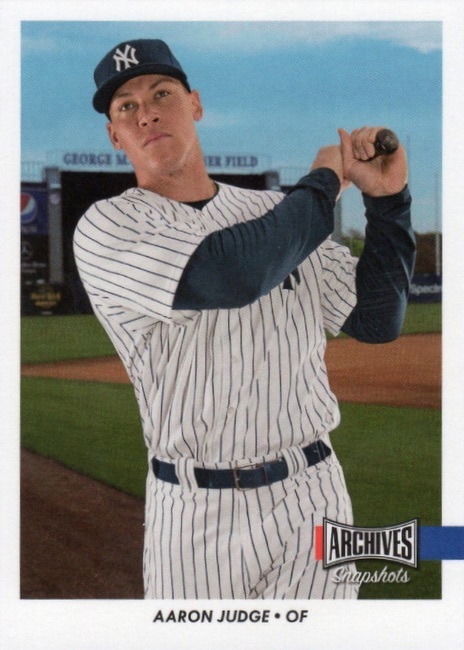 Similar to the 2016 set, the 2017 Topps Archives Snapshots Baseball checklist offers 50 names from across the history of the sport. In addition to 10 base cards per pack, a Black and White parallel comes in each box, and the hand-numbered Gold parallel is a new option limited to 10 copies. All signed directly on the card, base Autograph editions fall in every box. Collectors can also chase hand-numbered parallels via Black and White (#/25), Missing Black Plate (#/10), and Gold (1/1) versions. 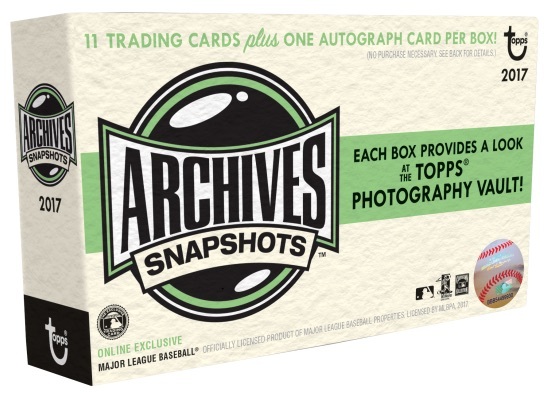 2017 Topps Archives Snapshots Baseball boxes go for $25 and are sold on the Topps website starting Thursday, October 19. 50 cards. 10 per box. Buy boxes on Topps. PARALLEL CARDS: Black and White (1 per box), Gold #/10. 33 cards. 1 per box. Hand-numbered. Buy boxes on Topps. Print runs provided when known. Redemptions noted. PARALLEL CARDS: Black and White #/25 or less, Missing Black Plate #/10, Gold 1/1. Purchased 2 boxes and pulled 1 gold base parallel and a redemption for a black plate removal auto of aaron judge. Wish i had purchased a few more boxes great price and great product! Not much to the cards but sometimes the more simple the better… Cards for sale on ebay are showing pictures of numbered autos but numbers that dont match the checklist. Do certain players sign less and some sign more than others? Shayne: Correct. Usually the better players have less cards and the less popular options, younger players or rookies have more. Hey Topps, Thanks again for all the Tigers. I know they are not good, but they do still have fans. Great product! Perfect price for a special set with a guaranteed auto. Bought 2 more boxes with good hit. Also have been seeing breaks where people are pulling 2 autos in 1 box! .. has anyone heard of a blank back 1/1? I seen a few for sale on ebay but thinks its a scam. Shayne: Those 1/1 blank back cards are not a scam. If you check the seller (thetoppsvault), it’s the official eBay account for Topps. They sell similar cards for many of their other sets. Yes, thank you. Of course, after I asked on here I noticed that. Thanks a lot. Good luck to everybody on good hits! I love this set. The photography is gorgeous, the design is clean and uncluttered, and I’m not sure I’ve seen a set so consistently perfectly centered! Somethiing I’ve been wondering about, though; why are there no RC badges? 2016 Topps Archive Snapshots Hobby Box. 1 autograph per box! (5) 2016 Topps Archives Snapshots Baseball Factory Sealed Box-5 AUTOGRAPHS ! !